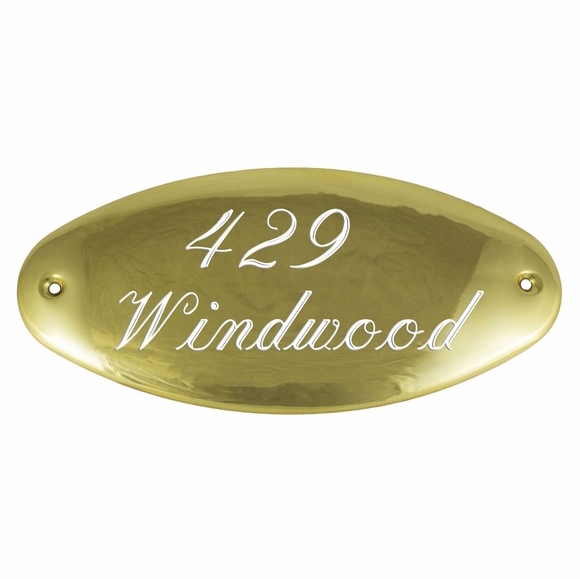 Small Brass Address Plaque two line address sign personalized with the house number and street name you supply. Wall mount. Elegant 7.5" x 3.5" oval won't overwhelm a smaller porch or narrow column. Deeply engraved and enamel filled. Includes mounting hardware. Four engraving (font) styles: clarendon, old english, optima, and script (shown above). Small image contains a sample of each engraving style. Two engraving colors: white or black. Line 1 holds up to five (5) characters. Line 2 holds up to eight (8) characters. Color: polished brass with white or black personalization. Clean with a soft cloth, mineral spirits; avoid harsh chemicals. 7.5" x 3.5" oval polished brass address plaque.